Evidently our elected EPISD board needs training. It also appears that we need some expensive folks from out of town to do the training. Each one day session evidently requires a half day of preparation by the facilitator. 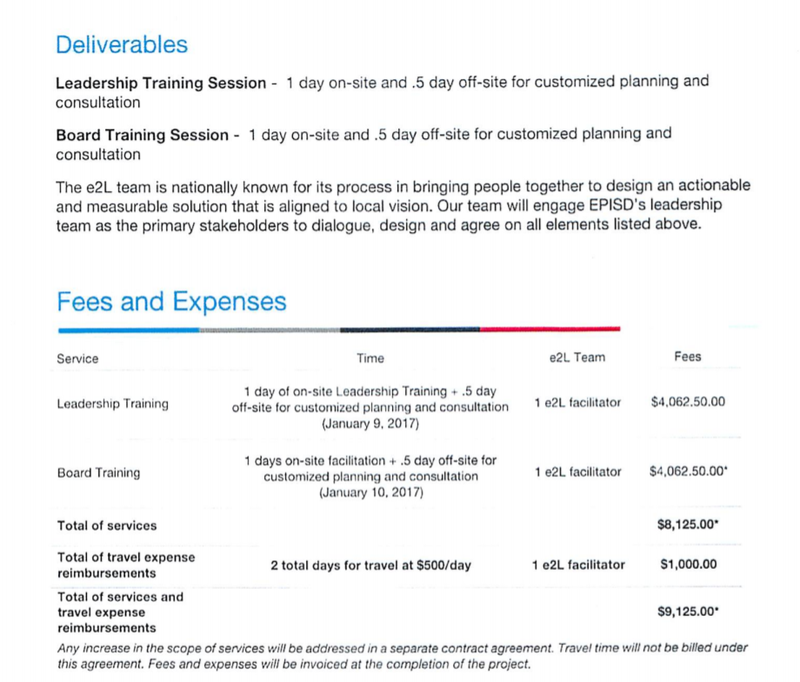 Each day of board training costs over $4,000 plus expenses. From what we’ve heard the training is largely about how to cooperate with the superintendent. This entry was posted on Saturday, February 4th, 2017 at 5:00 AM and is filed under El Paso Independent School District. You can follow any responses to this entry through the RSS 2.0 feed. You can leave a response, or trackback from your own site. My daughter saw this on social media a few minutes ago. Anybody know if there’s any truth to it? If it is true, why oh why would they want to destabilize La Bowie again? Anybody? Bueller? Bueller? Ideally, the board president would be qualified to lead these types of facilitated idea jams with the board. But in a democracy, you get who you elected, not always the perfect candidate. As for the half day prep, that sounds light to me and means the consultant has an out-of-the-box program for the board, not one based on interviews and issues research. If you recall, the city hired a local guy to lead CC thru a facilitated strategic planning process. You know SWOT, Vision, Mission, Goals etc. Then it got put in a 3-ring binder and put on a shelf to collect dust, as these things usually do whether in government or business, and people went about their same-old-same-old. Word on the street is that there are tons of “consultants” that the district has hired over the past three years. E2L is Engage to Learn. The super has his own special consultant that follow him around from meeting to meeting: an older gentleman that we see from time to time sitting in the background at meetings when the super blesses us with his presence. No telling how much he gets paid. It sounds like we’re paying for private tutors for highly paid super-man because he wasn’t qualified when he was given the job with a pay package greater than the vice-president of the U.S. The training seems to be working. He keeps getting more money.